2nd Thur Log thanks to Jamie Ewan. RF-36052/Russian Air Force (Open Skies) Antonov An-30 c/s “OSY33F” – 4,00 ft Overfly. ZJ221 /Apache AH1 – c/s “***********” – PAR & Wheels on landing. ZK563/QiniteQ/Chinook HC6 c/s “Boeing 23” – Trials on Donna Nook.- Overfly. G-FFMV/COBHAM/DA 42-M-NG c/s “Nighthawk” – Departed. ZK452/L /45(R)Sqn/King Air B200 c/s “Cranwell 05” – ILS. ZK364/Unmarked c/s “Tarnish 69” – Delivery from Warton. ZA720/Chinook HC4 c/s “Vortex 555” – Fuel stop – Parked on Sierra. 6th Mon Log thanks to Susie & Rich. ZJ912/912 code only – QRA change over – HAS 1. G-MAJJ/JJ/Eastern/Jetstream 41 c/s “East Flt 104” in “105”. 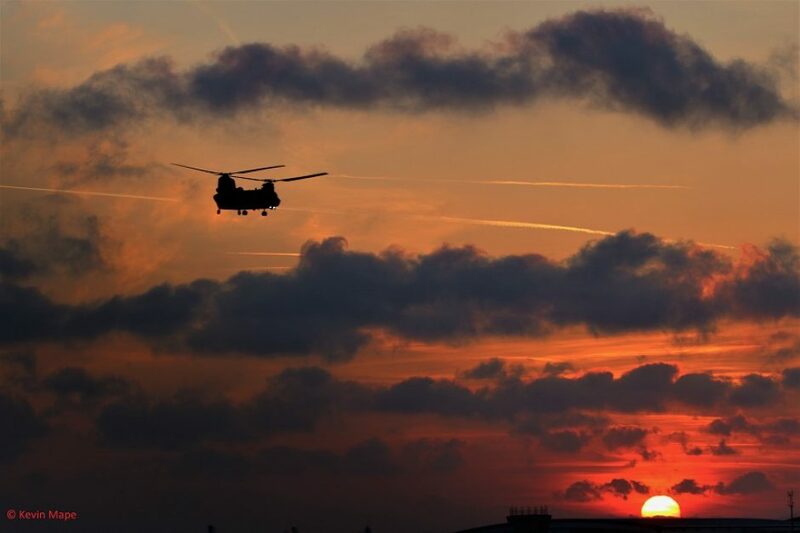 ZJ917/917 code only QRA change over – From HAS 1 back to Sqn. ZK377/Unmarked – engine runs on the ASP. ZA612/074/Unmarked/Tornado GR4 c/s “Marham 01” – Overshoot. G-MAJJ/JJ/Eastern/Jetstream 41 c/s “East Flt 105” in “106”. 29(R)Sqn – ZK354/BY,ZJ920/920 , ZJ912/912. 8th Wed Log thanks to Garf. G-MAJJ/JJ/Eastern /Jetstream 41 c/s “East flt 101” in “102” – out. ZK304/FM code only c/s “Typhoon 13” – To Lossiemouth. ZJ918/Unmarked c/s “Typhoon 24” – Aborted take off. 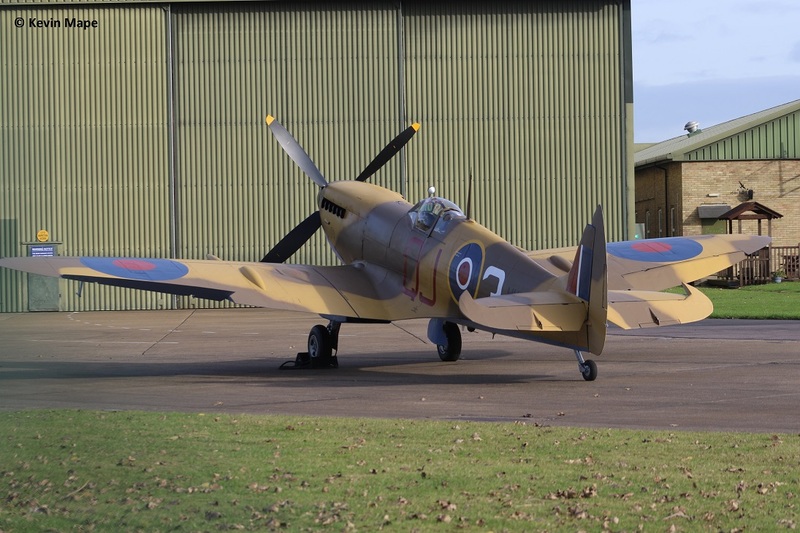 MK356/QJ-3/92Sqn marks/Spitfire IXe – Delivery from Biggin Hill to BBMF – Desert Camo. 9th Thur Log thanks to Garf & Rob W.
G-MAJJ/JJ/Eastern /Jetstream 41 c/s “East flt 102” in “103” – out. ZJ275/75/DHFS/Squirrel HT1 c/s “Shawbury 34” – Parked on Sierra. ZJ276/76/DHFS/Squirrel HT1 c/s “Shawbury 62”- Parked on Sierra. 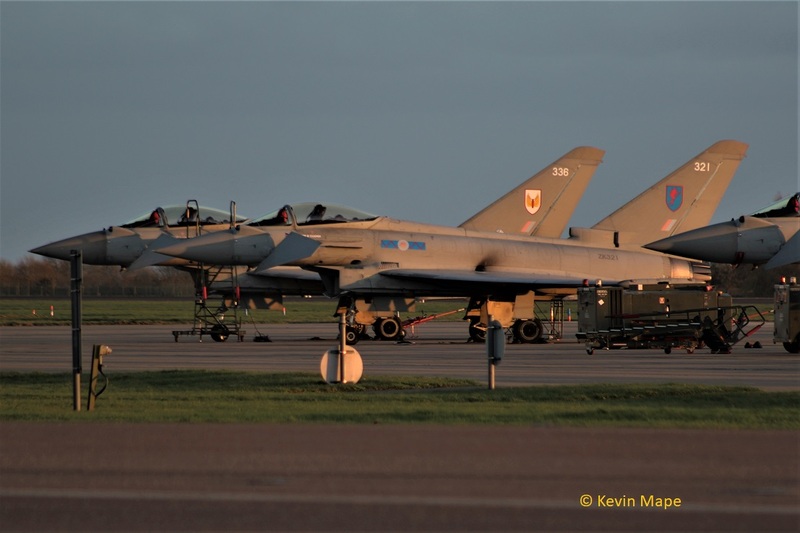 ZK310/310 code only c/s “Rampage 21” – Diverted to Waddington after mission due to Cby runway being black. ZG771/Special marks/Tornado GR4 c/s “PAN Marham 63” – took the RHAG due to Hydraulic failure. 29(R)Sqn – ZJ800/BC , ZK342/342. 41(R)TES – ZK365/EB-L , ZK315/ 41 special. 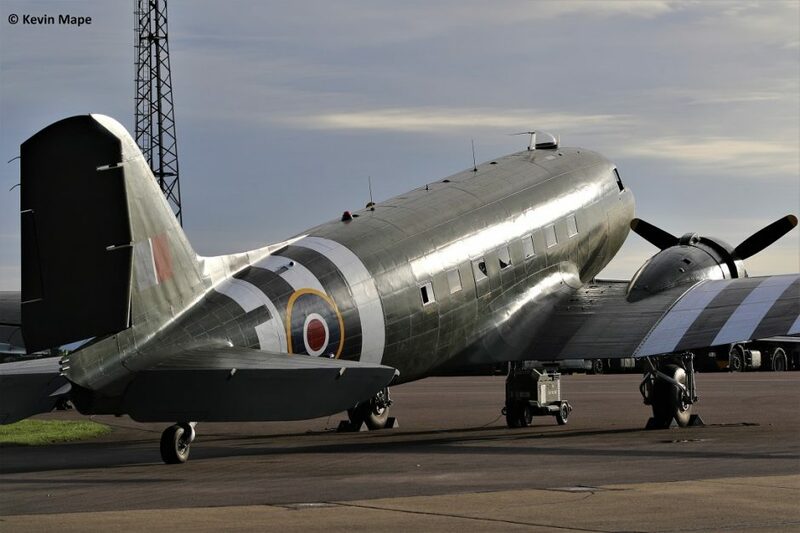 BBMF – ZA947/UK Dakota III , MK356/QJ-3/92Sqn marks Desert camo. 10th Fri Log thanks to Susie. ZF290/290/1FTS /Tucano T1 c/s “LOP 26” – Overshoot. ZJ939/939 code only – QRA radio check – 15-54pm. ZG771/Black tail special/Tornado GR4 c/s “Marham 48” – Departed. TMF – ZK358/Unmarked – Engine runs.41(R)TES – ZK315/41Sqn special – Towed to the Southside. ZK358/Unmarked – Towed onto the ASP – Engine runs. ZA947/UK/BBMF/Dakota III – Noted outside BBMF. ZJ920/920 code only – Towed to Echo. ZK342/342/6Sqn – Towed to Echo HAS 5. ZK365/EB-R/41(R)TES c/s “Apollo 11” – Armed with Storm Shadow. 1st for a Typhoon at Cby. 91-0337/LN rd/48FW/F-15E c/s “Warman 61” – Overshoot. Echo – ZK342/342/6Sqn,ZJ920/920 code only. 15th Wed Log thanks to Susie & Garf. PM – Thanks to Garf. XX204/RAFAT/Hawk T1 c/s “Red 3” – Overshoot. 16th Thur Log thanks to Garf. ZA670/EB-X/41(R)TES/Tornado GR4 c/s “Rebel 88” – departure of the last Tornado GR4 at Coningsby. 21st Tue Log thanks to Steve & Val. 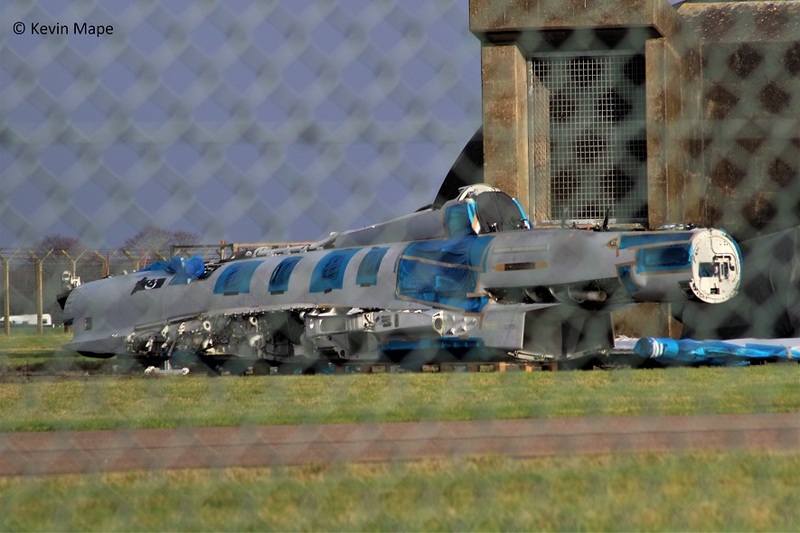 ZJ808/ Typhoon T3 Fuselage dumped outside HAS 58. 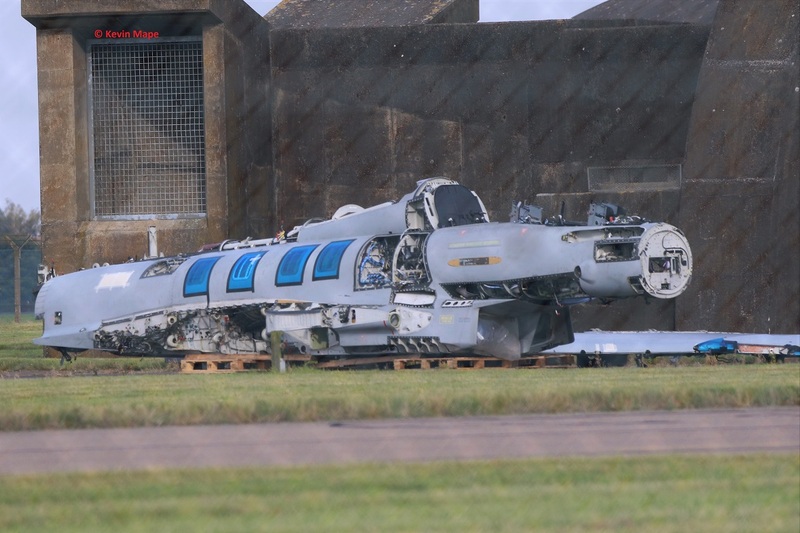 ZJ815/Typhoon T3 fuselage is wrapped up and sat next to it. ZJ929/929 code only – Toed from HAS 1 to HAS 3 for QRA duty. ZA560/EB-Q/41(R)TES marks/Tornado GR4 c/s “Marham 22”- Overshoot. P7350/BBMF/Spitfire IIa c/s “Spitfire 90” – Display then to Biggin Hill. 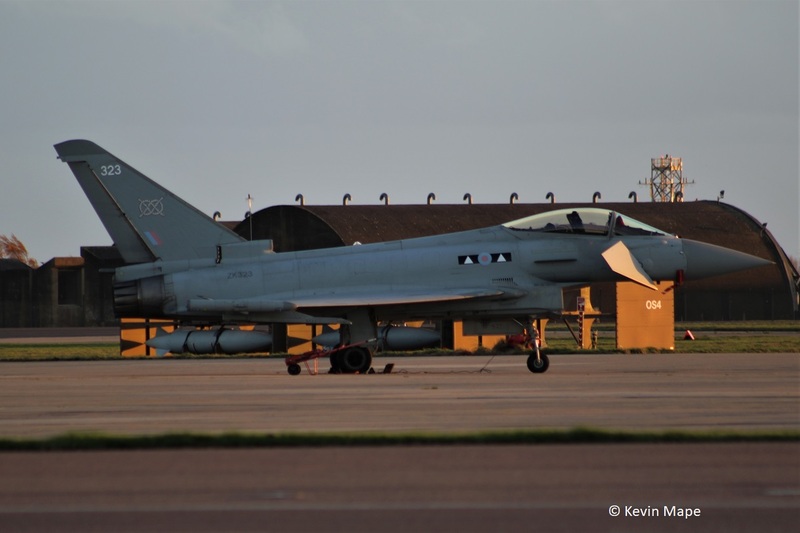 ZK332/332 code only c/s “Typhoon 121” – Delivery to Lossiemouth. ZK358/Unmarked – towed from TMF to the ASP. WK518/C/BBMF/Chipmunk T10 c/s “Chippy 96” – To Biggen Hill to bring Milli back. ZK339/EB-E/41(R)TES c/s “Apollo 21” – Ground abort. ZK344/344 code only – Towed from TMF north side to south side. ZK361/Unmarked – Towed from TMF north side to south side. ZK321/321/6Sqn c/s “Lossie 96” – Delivery to TMF. ZK336/336/1(F)Sqn c/s “Lossie 70” Delivery to TMF. ZK344/344 code only c/s “Lossie 96” – To Lossiemouth. ZK323/323/II(AC)Sqn – Engine runs on the ASP. ZK323/323/II(AC)Sqn c/s “Lossie 70” To Lossiemouth. ZH896/Chinook HC6A c/s “Vortex 397” – Overfly to Donna Nook. ZK459/X/45(R)Sqn special/King Air B200GT c/s “Cranwell 75” – Overshoots. ZM404/Atlas C1 c/s “Comet 448” – Overfly. 27th Mon Log thanks to Ness,Barr & Garf. G-MAJB/JB/Eastern/Jetstream 41 c/s “East Flt 101” in “102” -out. CE-03/21Sqn/ EMB135 c/s “Belgium Air force 615” – Departed. ZK382/382 code only c/s “Typhoon 22” – PD at Waddington. ZK459/X/45(R)Sqn special/King Air B200GT c/s “Cranwell 75” – Rollers. ZJ917/917 – QRA radio check. ZK335/335/41(R)TES c/s “Apollo 11” – To Donna Nook. ZK367/EB-R/41(R)TES c/s ” Apollo 12″ – To Donna Nook. ZK460/U/45(R)Sqn special/King Air B200GT c/s “Cranwell 66” Overshoots. ZF135/135/1FTS/Tucano T1 c/s “LOP 22” – Overshoot. 29th Wed Log thanks to Garf & Susie. G-MAJJ/JJ/Eastern/Jetstream 41 c/s “East Flt 101” in “102” -out. ZG775/134 code only/Tornado GR4 c/s “Marham 35” – Parked on the ASP. n/s. ZD741/F-LS/XVSqn special/Tornado GR4 c/s “Marham 32” – Overshoot. ZK375/Unmarked – Noted on the ASP. ZK343/Unmarked – noted on the ASP. 30th Thur Log thanks to Garf. 91-0309/LN rd/48FW/F-15E c/s “Casino 21” – Overshoot. ZM402/402/70Sqn/A400M Atlas C1 c/s “Ascot 458” – Departed. ZJ929/929 code only c/s “9 Sierra Whisky 36” -QRA – stood down. ZJ917/917 code only c/s “9 Sierra Whisky 37” – QRA stood down. XW216/Puma HC2 c/s “Vortex 345” – Departed. TMF – ZK364/Unmarked – Noted on the ASP. 3(F)Sqn c/s used : Chaos ,Esther , Nightmare, Rampage, Typhoon 02 – 10, 12- 27. XI(F)Sqn c/s used : Havoc, Razor, Tyrannt. Typhoon 11 , 60 – 82. 41(R)TES c/s used : Rebel , Apollo . ZK367/EB-R/41(R)TES : Typhoon FGR4 – Flew with a Storm Shadow 14/11/17. ZA607/EB-X/41(R)TES : Tornado GR4 – Departed 16/11/17 to Marham. TMF Hangar for November have included. 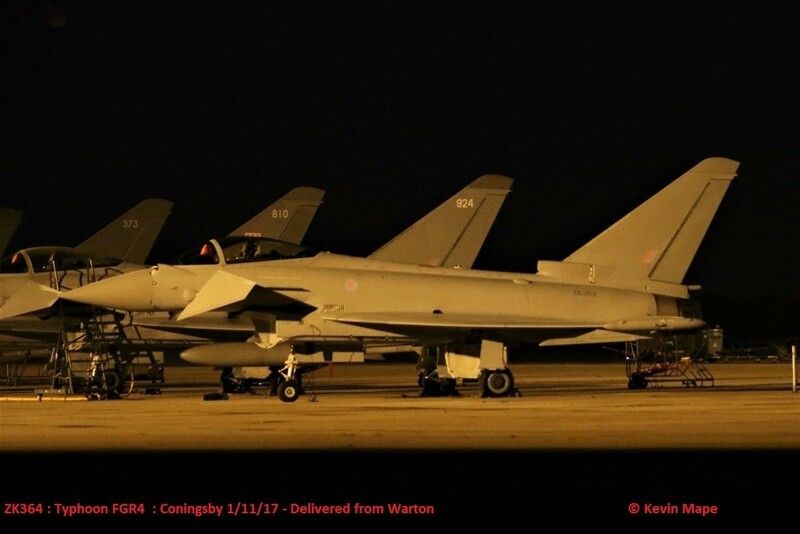 ZK344 : 344 code only : Typhoon FGR4 – Delivered 24/11/17 to Lossiemouth. ZK323 : 323 : II(AC)Sqn : Typhoon FGR4 : Departed 24/11/17 To Lossiemouth. ZK326 : FB : 1(F)Sqn : Typhoon FGR4 : Stored. ZJ804 : 804 : 29(R)Sqn : Typhoon T3 : To RTP 14/11/17. ZJ806 : BE : 29(R)Sqn : Typhoon T3 : on RTP. Fuselage only. ZJ808 : Fuselage only : Typhoon T3 : on RTP. Fuselage dumped outside HAS 58 on the southside. Stored on the South side. 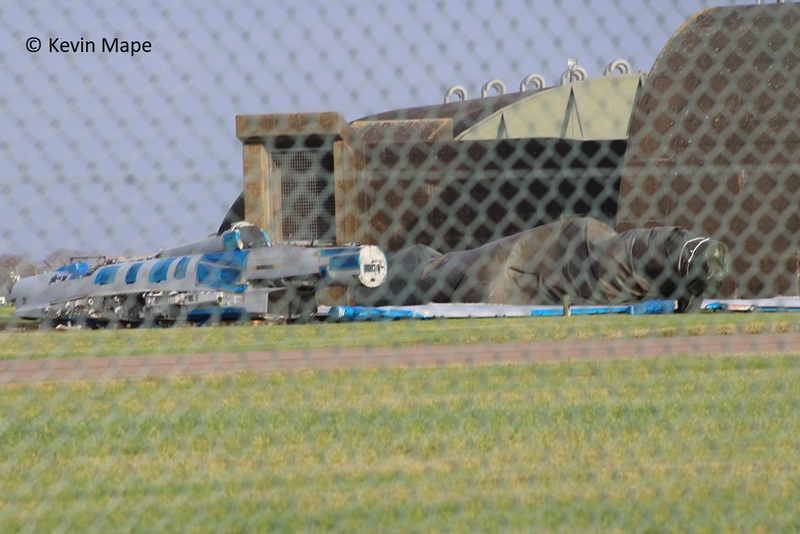 ZJ815 : Fuselage only : Typhoon T3 : Dumped outside HAS 58 – Now covered.